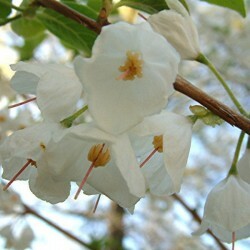 The dainty, white flowers of Carolina silverbell are a lovely sight to behold in springtime. This multi or single-trunked deciduous tree is native to the central and eastern United States where it inhabits woodland areas with rich, fertile soils. There are two varieties that vary in height. 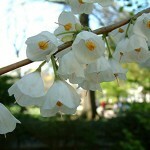 Halesia tetraptera var. 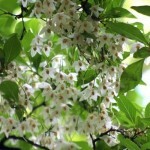 tetraptera becomes a small to medium sized tree and Halesia tetraptera var. monticola becomes very large. Mature specimens develop large, rounded crowns. As the first of its yellow-green leaves begin to emerge in spring, clusters of two to six pendent, white, bell-shaped blossoms line the branches. 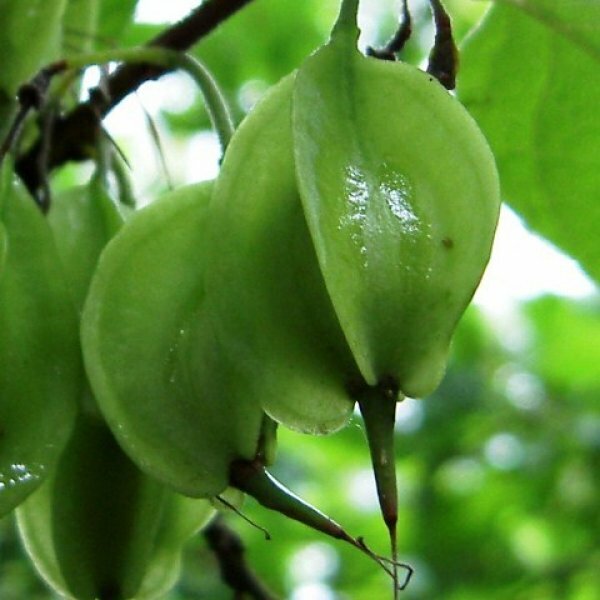 These are frequented by bees and mature to four-keeled, yellow-green fruits that dry to tan in autumn. The fall foliage turns a rather unspectacular mottled blend of yellow and green early in the season. Its grayish brown bark is shallowly furrowed and offers limited winter interest. Plant Carolina silverbell in a moist, fertile soil that is on the acid side. It will tolerate slightly alkaline soil but may suffer from nutritional deficiencies if the soil is too limey. Full sun encourages the best habit and heaviest flowering, but this tree will also thrive in partial shade. Mulch with leaf mold or partially composted bark mulch if planted in a woodland setting. This spring bloomer looks pretty with azaleas and woodland flowers planted at its base. 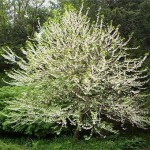 Its delicate white blooms are especially appealing when viewed from beneath the branches, so consider planting it near a park bench where people can gaze up at them. 2. Prepare the planting pots as the seed pods soak. Fill several 2-gallon plastic pots with a mixture of 2 parts potting soil, 2 parts compost, 1 part coarse sand and 1 part perlite. Water the pots of soil to a depth of 5 inches and allow the soil mixture to drain for 30 minutes. 3. Scratch a depression in the center of each pot of soil 1 inch deep. Place the whole seed pod into the hole so it is lying on its side, and bury it in compost. 4. Spread a 1-inch-thick layer of shredded pine mulch over the top of each pot. Place the pots in a ventilated cold frame for the winter. Water the pots to a depth of 5 inches once a week. 5. Remove the pots from the cold frame in spring and place them somewhere with partial shade and protection from the wind. Continue to water to a depth of 5 inches once a week. 6. Leave the pots outdoors for their second winter. Check for signs of germination in the spring. Keep the saplings in their nursery pots for one year after they sprout to allow them to establish a productive root system. 7. Plant them out in early spring of their third year. Choose a permanent planting site with rich, acidic soil and partial shade during the hottest part of the day.